Antonio Brown is an American professional footballer for the Oakland Raiders of the National Football League (NFL). Before joining The Oakland Raiders, he played for the Pittsburgh Steelers team. The sportsman became the star player for his team and went on to break numerous NFL records. 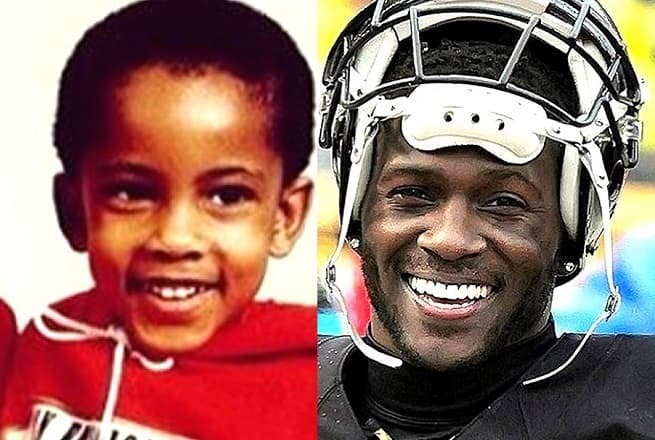 Antonio Brown was born on July 10, 1988, and was raised in Liberty City, Miami, Florida. His father, Eddie Brown, is a former Arena Football League player. He played for the Albany/Indiana Firebirds and was recognized as the league’s greatest player ever. His mother's name is Adrianne Moss. Antonio's younger brother, Desmond Brown is also a professional footballer and plays for Pittsburgh Panthers. His parents separated in the middle of 1990s. His mother married a second time when Antonio was 12 years old. By reason of frequent quarrels with his stepfather he left his home at the age of 16. He stayed at a friend's house, sometimes slept inside a car or in a cheap motel for about six months. Antonio studied at Miami Norland High School in Miami, Florida. He was an athlete in both football and track, and earned the 'North Athlete of the Year' title at 2005 Miami-Dade Gridiron Classic. Antonio used an opportunity to earn a scholarship at Florida International University in Miami. However, he was excluded from the University for beginning the controversy with security. Fortunately, Zach Azzanni, his old acquaintance, called Antonio and offered him to play for Central Michigan University as a walk-on wide receiver. At first, coach Butch Jones doubted in Antonio's talent, but he soon realized that Brown had high potential, and played him for 14 matches during his freshman year. Antonio won the 'Mid-American Conference Freshman of the Year' and became All-Conference returner. In his sophomore year in 2008, Brown played in all the games and set the records for best single-season figures of 110 receptions, 1,198 receiving yards, and nine touchdowns. In 2010, Antonio Brown didn't complete the senior year of the college and entered the 2010 NFL Draft. It was decided by the Pittsburgh Steelers to place Antonio as their 2nd wide receiver pick and the 22nd overall wide receiver. He chose jersey number 84, which he found motivational. The 2010 season against the Tennessee Titans was his debut. He helped his team reach the Super Bowl, but failed to win his first Super Bowl match against the Green Bay Packers in February 2011. During the 2011 season, Brown took the position of the Steelers' third wide receiver behind the players Hines Ward and Mike Wallace. In general, Antonio played 16 games in 2011 and made 69 receptions for 1,108 yards, two touchdown receptions, and three starts. The 2012 season was a difficult one. Antonio was fined for $10,000 for unsportsmanlike conduct in a match against the Washington Redskins. He got injured, suffering from the ankle sprain. Because of the need to recover, he had to miss three games. Brown began the 2013 season as a starting wide receiver for the Pittsburgh Steelers along with Emmanuel Sanders. He succeeded to break the 1997 record by Yancey Thigpen for single-season team record of 1,398 receiving yards. On December 27, 2013, he played for the Pro Bowl as a receiver and a punt returner. On January 3, 2014, he was named to the AP All-Pro team for the first time in his career. Antonio took the 23rd position by his fellow players on the NFL Top 100 Players of 2014. In 2014, Brown attracted media attention after accidentally kicking Cleveland Browns punter in the face mask. He had to pay $8,200 and later apologized for the accident. By the end of 2014, he made three new team records for 129 receptions, 1698 receiving yards, and 13 touchdowns. His fortunate season brought him a third Pro Bowl selection. In 2015, Antonio went into NFL's 200 all-time receiving yards list with a career total to 5,587 yards, leaving Lynn Swann behind. During the season, he improved his previous record with 136 receptions for 1,834 yards and 10 touchdowns. Brown was named to his third consecutive and fourth career Pro Bowl.. He also took top positions as a wide receiver and the fourth best player on the NFL Top 100 Players of 2016. Brown started the Steelers' season against the Washington Redskins and finished the 38–16 victory with eight receptions for 126 yards and two touchdowns. After the game, Antonio was reprimanded by the NFL for wearing baby blue cleats. He had to pay a fine estimated at $15,191 for breaking the league's uniform policy. Brown was also amerced for twerking after scoring his second touchdown. After performing a similar dance in the end zone against the Kansas City Chiefs, Brown was fined $24,309. The sportsman became famous for his dancing during matches. His fans and some of the news hosts on television even tried to repeat his moves, but the league considered this behavior irrelevant. Brown was working to better his previous running results. While preparing for the 2016 NFL season Brown improved his 40-yard dash time. During the 2016 season, he entered the NFL top 100 all-time for career receptions, as well as top 100 for career receiving yards. 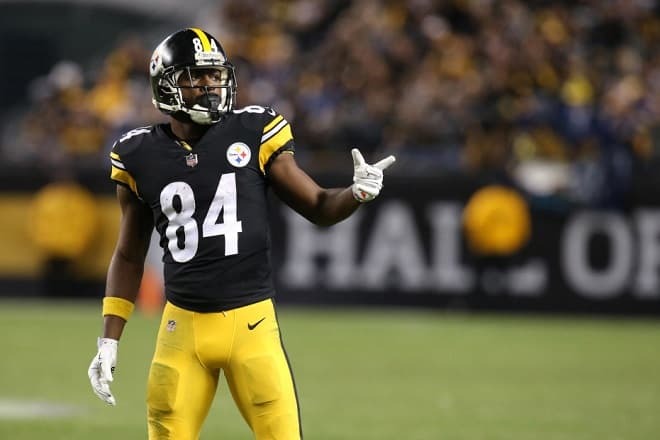 By the end of the season, he became second in career receptions and third in career receiving yards for the Steelers, while ranking 57th and 78th in the NFL all-time list. On February 27, 2017, Antonio Brown signed a new five-year contract with the Steelers through the 2021 season. For his play in Week 11, Brown was called AFC Offensive Player of the Week. During the 2017 season, Antony got a toe injury in a game against the Ravens and a left calf injury playing against the New England Patriots. Later after the results of medical examination, Brown was told that his left calf was partially torn. It meant that he would not play for the rest of the regular season. But Brown had a possibility to return during the playoffs. After the win over the Chiefs, Brown made a live stream broadcast on Facebook, celebrating the victory in the team's locker room. He broke the NFL rules and the requests to "keep a low profile on social media." In the video there was a head coach, Mike Tomlin, brusquely speaking about championship round opponent New England. Later Mike Tomlin apologized and had given a talk to Brown. The end of the 2017 season was very productive. Brown was leading the league with 1,533 receiving yards for the second time in his career. He was named to his sixth Pro Bowl and first-team All-Pro. He hit the top on the NFL Top 100 Players of 2018, as the second best player and the best wide receiver. On September 9, 2018, in the season opener against the Cleveland Browns, Brown reached 10,000 career receiving yards in the 21–21 tie. He achieved the milestone in 116 career games. Brown finished the 2018 season with 168 receptions for 1,297 and a career-high 15 touchdowns. After arguing with quarterback Ben Roethlisberger and then skipping practices leading up to the game against the Cincinnati Bengals, Antonio was benched for that game. The 2018 season turned out to be disappointing for Brown. He wasn't satisfied with his role in the team. Summarizing all the unpleasant moments, Antonio finally asked for a trade. On March 9, 2019, the Steelers traded Brown to the Oakland Raiders in exchange for a third- and a fifth-round selection in the 2019 NFL Draft. The deal became official on March 13, 2019. 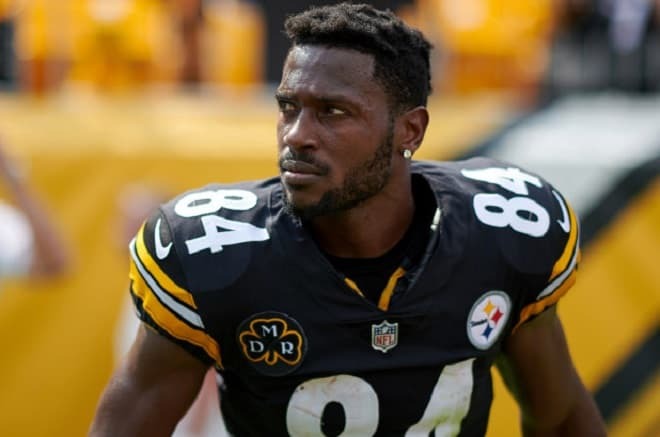 According to career stats, since 2010, Antonio Brown has played over 115 games in the process of which he has recorded 733 receptions, gaining 9,910 receiving yards. Furthermore, he has averaged 15.2 and 59 touchdowns. He became the first player in the NFL to have more than a hundred receptions, over 1200 receiving yards, and make more than 5 receiving TDs in five straight seasons. The player was ranked the second on the NFL Top 100 Players of 2018 list. 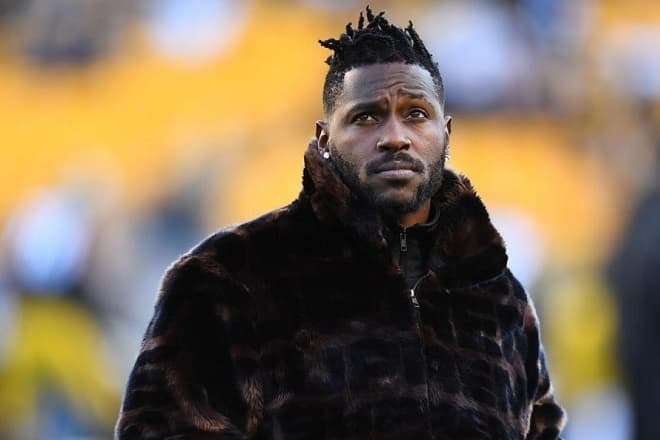 Antonio Brown has five children from three different women. Since 2011, he has been in a relationship with Chelsie Kyriss, with whom he has two sons, Autonomy and Ali King. Kyriss seems to be having a great relationship with Antonio, and some of his friends recommended him to make her his wife. 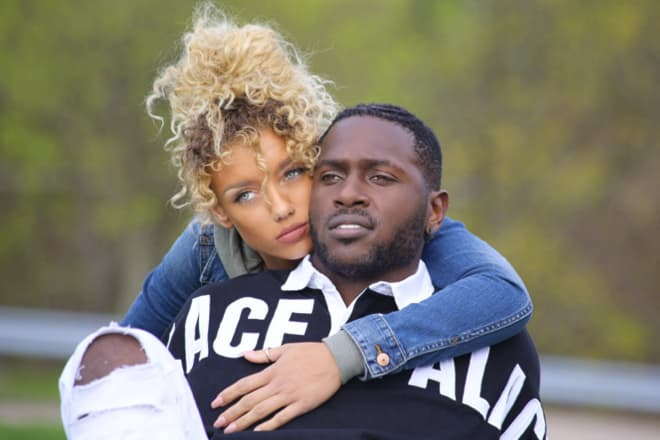 In early 2017 there were rumors, supported by pictures on the Internet, that Brown was dating the Instagram model and actress Jena Frumes, while his wife was pregnant. However, Brown reportedly left her to be with Chelsie Kyriss. The two are still together. 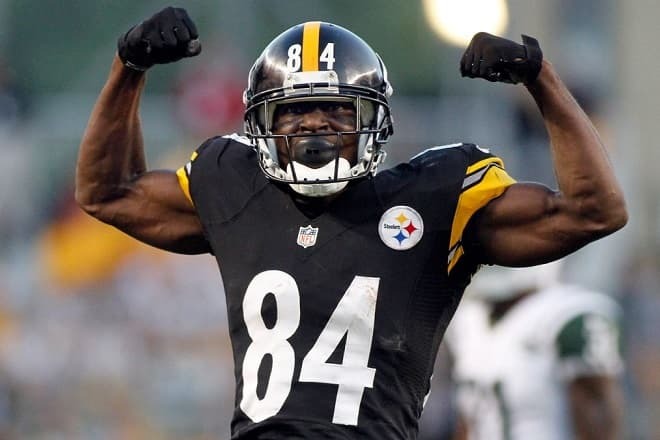 Antonio Brown is a sportsman with an athletic body. He stands at 5 ft 10 in (1.78 m) and he has a body weight of 181 lb (82 kg). In 2018, Brown took part in recording artist Drake's music video for "God's Plan". On July 18, 2018, Brown appeared at the cover for Madden NFL 19. 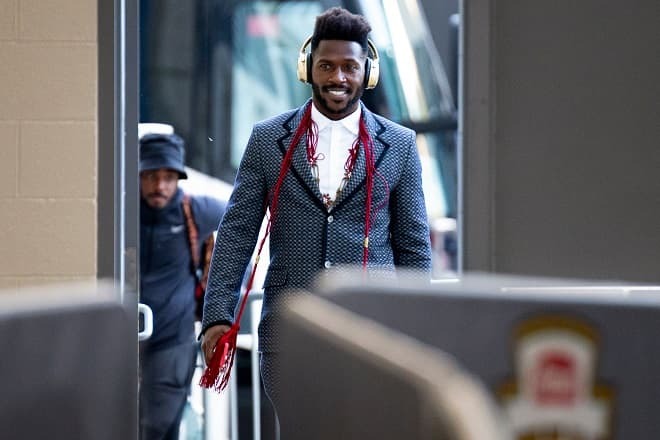 In 2018 Antonio Brown was stopped for speeding over 100 mph in his Porsche, just hours before the team's game against the Carolina Panthers. He was cited for reckless driving. Reckless driving convictions in Pennsylvania can result in fines, a suspended license and up to 90 days in jail. Brown has paid $426.77 in fines. In 2019 Brown was accused in the news of pushing a mother of his daughter to the ground. Brown's lawyer noted that the media was trying to use these accusations to denigrate sportsman's reputation. The sportsman starred in commercials of Pizza Hut, Visa, Campbell's Soup and Pepsi. Antonio stands out for his style, as he wears unusual haircuts. There is even a tutorial on Youtube on how to make Antonio Brown haircut. His t-shirts with number 84 are on big demand and are sold all over the world. Antonio has a net worth estimated at $16 million. On March 8, 2016, Brown competed on season 22 of Dancing with the Stars. 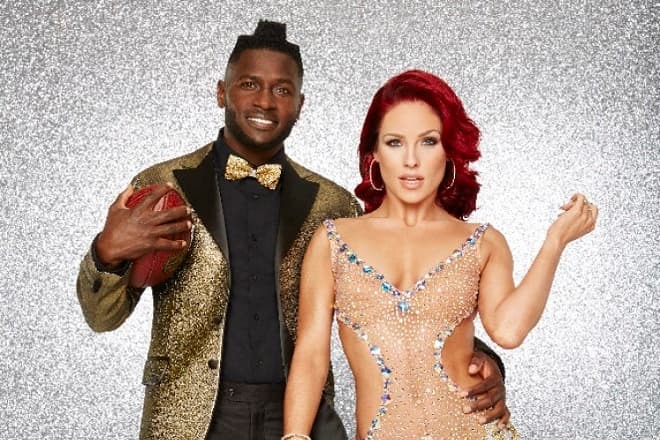 He was paired with professional dancer Sharna Burgess. Brown and Burgess were eliminated during the semifinals of the show and finished the competition in fourth place overall.